I hope that all of you had a great holiday celebration wherever you happened to be. 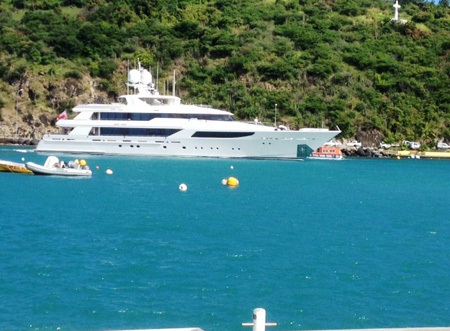 Lots of things are going on here in St. Barts. The harbor is brimming with Mega-Yachts – a beautiful sight to see both day and night. Monday evening Steve and I decided to check out things in Gustavia. 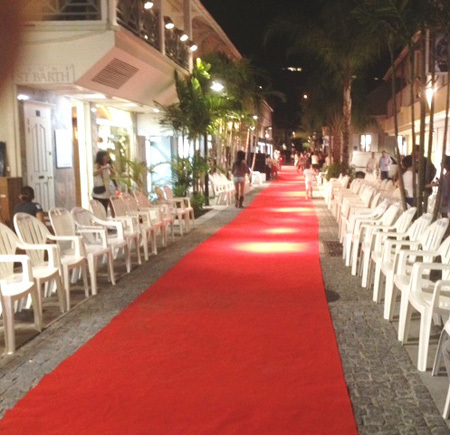 A fashion show, Ballade en Ville, on the new cobblestone rue de Général de Gaulle was scheduled to start at 8:00 pm. We strolled along the harbor and looked at the Christmas scene which is displayed on one of the stages on the quai. 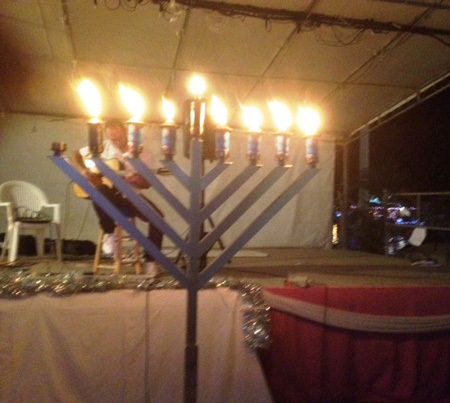 At the very same time there was a Hanukkah celebration going on and it was taking place only a few yards away on a different stage. It was fun to see that two religious groups can coexist very nicely here on St. Barts. After watching some of the fashion show and not having made dinner reservations, we decided to go to the Baz Bar because we love the place and they do not take reservations. We sat at a lovely table by the water and watched the Tomas Doncker Band perform. As we were concluding our delicious dinners, clients who have become great friends of ours walked by. We invited them to join us while we finished up our great bottle of Sancerre blanc (my favorite). 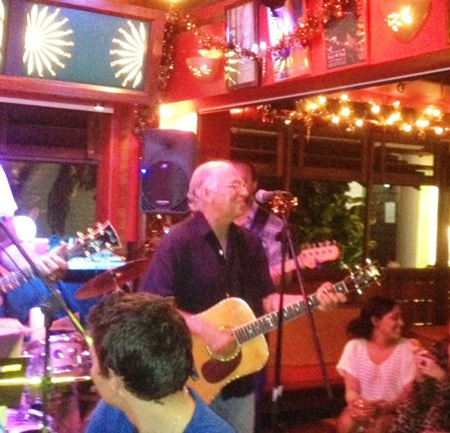 Jimmy Buffett along with family and friends happened to be dining at the Baz Bar too and suddenly the band was in their second set and up jumped Jimmy with his guitar. He began singing “Volcano” but changed the lyrics to describe what St. Barth is like at this time of year! What a treat for us all. If you come down to St.Barth, you may be one of the lucky ones to enjoy one of Jimmy’s impromptu performances. Contact reservations@stbarth.com to reserve your villa or hotel. I left St. Barts 3 weeks ago so that I could host Thanksgiving at home. (My 22 pound fresh turkey that I carefully prepared and stuffed was outstanding, if I do say so myself.) 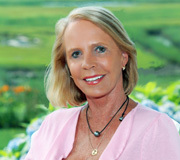 December brought me back to paradise as it was time to leave chilly Cape Cod, Massachusetts in favor of warm and sunny St. Barts where I will be based until late spring 2012. I will fill you in on all of the latest happenings. I enjoy a close relationship with many of the hotels on St. Barts because, in addition to offering our guests a villa vacation, we have other people who prefer to stay in a hotel. I have been working with these St. Barth hotels for 23 years which means that I witnessed many changes in both management and transformations and over the years, I have seen a few hotels come and go. I follow our hotel partners with great interest as they make various renovations and wonderful additions to their properties. 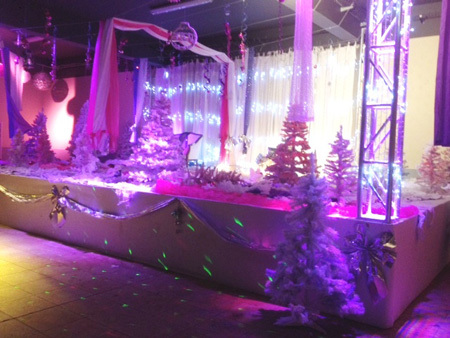 Last Thursday, I was invited to the hotel Christopher’s weekly cocktail party. It was held poolside and the evening was perfect. Strategic lighting highlighted the waves as they lapped along the shore. Pierre-Alexandre Maillard had issued the invitation which included an after-the-cocktail-party delicious dinner with him at the hotel’s well-renowned Taïno restaurant. 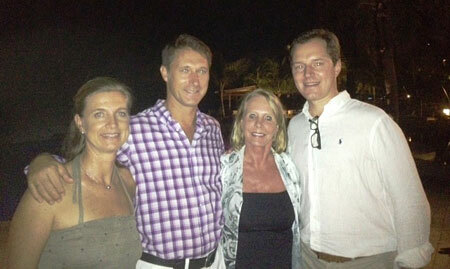 Pierre-Alexandre was the former GM at St Barth’s hotel Carl Gustaf. He left to the property so that he could manage a gorgeous hotel on a private island in the Seychelles. Happily, St. Bart’s uniqueness lured him back and I am pleased to announce that Pierre-Alexandre will be the new GM at the Christopher as of January 15, 2012! The Christopher has undergone an amazing renovation with gorgeous new suites, a new spa and a new fitness room. All of this was overseen by the present GM Christian Langlade who came to St. Barts from Sandy Lane in Barbados 2 years ago. His wife Sandrine was in charge of the marketing and excelled at it. 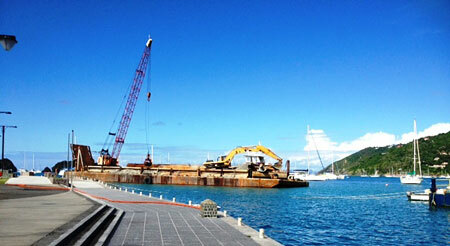 Luckily the Langlades will not be leaving St. Barth. Christian has accepted the General Manager position at the wonderful Le Sereno Hotel on Grand Cul de Sac Beach. Sandrine has also accepted a position at Le Sereno. I stayed there last month and enjoyed it immensely. It is quite chic, the staff is so friendly and the setting is dreamy. For our villa lovers, Le Sereno has three luxurious four bedroom villas on the property. Congratulations and I wish them all much success! La Banane is closing December 15, 2011 and will no longer be a hotel. I will keep you posted on any transformation that may occur. The very reasonably priced Tropical Hotel is conveniently located just up the hill from St. Jean Beach and is quite charming. The hotel is now managed by family member Aurélia Vial. The new pier on the other side of the harbor is almost finished and they are dredging the harbor (even on Sunday when I took this photo) to prepare for the onslaught of the mega-yachts that are arriving daily in order to get their much-sought-after-berth and prepare for the always amazing St Bart New Year’s Eve celebration. Many stay for the season. 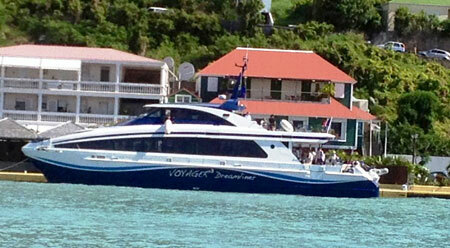 While I was on my morning walk, I saw the new Voyager Dreamliner ferry coming into the harbor. It looks so luxurious. I will take a tour one of these days and fill you in. Traveling by ferry could become the preferred and most affordable mode of inter-island transportation. I hear rumors that this new ferry hopes to be able to leave from the Dutch side of St. Maarten turning the transfer into only a 30 minute trip! If that happens I will buy a roundtrip ticket and test the waters for you, so to speak.